The first titles decided on the concluding day of action at the Sparta 2018 ITTF Pan American Championships in Santiago, Chile; on Sunday 25th November, in the Men’s Doubles and Women’s Doubles events the titles were retained; in the Mixed Doubles, a new combination was anointed. Brian Afanador and Adriana Diaz added their names to roll of honour. They were followed by the champions of one year ago in Cartagena de Indias; Alicia Côté and Zhang Mo alongside Vitor Ishiy and Eric Jouti. Occupying the no.2 seeded position, Brian Afanador and Adriana Diaz set the programme in motion. They accounted for Kanak Jha and Wu Yue of the United States, the top seeds (11-5, 9-11, 11-8, 11-3) to arrest the Mixed Doubles title. Quickly into their stride, the Puerto Ricans established a rhythm to their play and possessed a better understanding than their adversaries. The crucial part of the contest came in the third game; the overall match score level, Kanak Jha and Wu Yue led 7-5; they lost the next four points and eventually the game. Undoubtedly the success was a major boost for the Puerto Ricans; in the fourth game, they sped into a 4-1 lead; Jörg Bitzigeo, the United States coach sitting courtside, called “Time Out”. 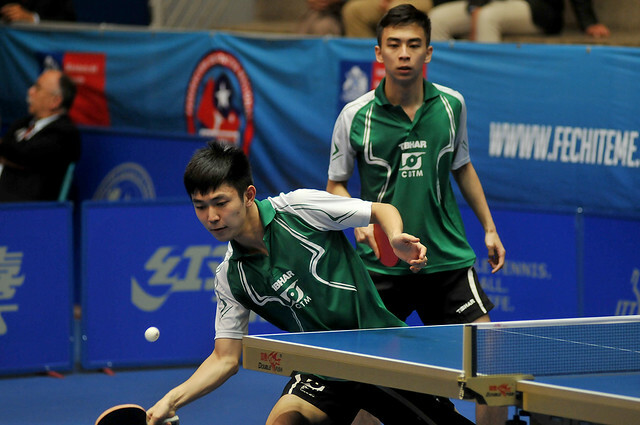 Kanak Jha and Wu Yue reduced the deficit to 5-3 but they did not win another point. Puerto Rico celebrated and that is something at which they excel. Last week they managed two public holidays and Christmas comprises a minimum three months. Disappointment for the United States, disappointment for Wu Yue; it was the same in the Women’s Doubles final. Partnering Lily Zhang, the no.2 seeds, they experienced defeat in four games when facing Alicia Côte and Zhang Mo, the top seeds (11-13, 11-3, 11-8, 11-7). A close first game won by Wu Yue and Lily Zhang but the United States duo was not able to build on that advantage as might have been expected; in the second game the Canadians won the first five points and never looked back. They secured a close third game, winning the crucial points before in the fourth establishing a 9-6 lead. Making errors and losing a degree of self-belief, trailing 9-6 in the fourth the United States duo called “Time Out” but very much the writing was on the wall. The Canadians surrendered just one more point; for the third time in the tournament, Wu Yue was the bridesmaid. Earlier in the proceedings she had been a silver medallist in the Women’s Team event. Most impressively, Alicia Côte and Zhang Mo justified their top seeded billing; it was the same for Vitor Ishiy and Eric Jouti. The Brazilians beat Paraguay’s Marcelo Aguirre and Alejandro Toranzos, the no.2 seeds, in straight games (11-5, 12-10, 11-6). Vitor Ishiy and Eric Jouti dominated the opening game but in the second, matters were level at 7-all; it was the crucial stage of the contest. Vitor Ishiy and Eric Jouti won the next two points before holding two game points at 10-8; both were saved by the Argentine duo but they could not repeat the feat for a third time. A two games advantage; in the third when trailing 5-4, Marcelo Aguirre and Alejandro Toranzos elected for “Time Out”; the break was not to prove to their advantage. Vitor Ishiy and Eric Jouti surrendered just two more points. Once again the Brazilians had struck gold. The semi-finals and finals of both the Men’s Singles and Women’s Singles events will be played later in the day.